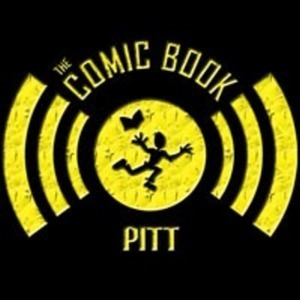 130 episodes of Comic Book Pitt since the first episode, which aired on October 31st, 2014. Dan and Jared are joined by Paul McGinty from the McSoss Comic Book Podcast and Chip Grossman from New Dimension Comics. Together, they talk about Amazing Spider-Man #801, Tony Stark: Iron Man #1, Man of Steel #4, Justice League #2, the work of Donny Cates, Bloodstrike: Brutalists #0, and Stellar #1. Dan is joined in the studio by Ian, Matt, and Paul of the McSoss Comic Book Podcast. They had a great time talking about the upcoming Batman/Catwoman wedding, if Bruce Wayne needs to exist, the return of West Coast Avengers,and ComiXology's new original content. Dan is joined this week by Ian, Matt, and Paul from the McSoss Comic Book Podcast. They discuss two landmark issues, one an ending and one a beginning...and one that we enjoyed and one...not so much. You'll have to listen to find out which is which. Dan and Scott talk about the events and comics of Free Comic Book Day and then review Avengers #1, Death or Glory #1, Thor #706, and G.I. JOE #251. Dan, Jared, and Shawn talk about Avengers: Infinity War (spoiler free), the Deadpool and Venom trailers, jumping on pop culture bandwagons, our favorite super hero headquarters, the end of Ash vs Evil Dead, and the 2018 Eisner nominations. Dan, Jared, and Shawn discuss 80 years of Superman with Action Comics #1,000, Superman #45, and Superman: The Dailies Vol 2. Other comics discussed are Skyward #1, Lulu & Mitzi: Best Laid Plans, and Mazy Devil by Aaron Bordner. Jim Rugg stops by the Sorgatron Media studio and talks with CBP about creating comics, Street Angel, professional wrestling, and more. We also talk about Blue Wraith #1, GI Joe #250, Street Angel #1, and Is This Guy For Real? The Unbelievable Andy Kaufman. Guest Marcel Walker hangs out with us to talk about Chutz-POW! : Superheroes of the Holocaust, the past, present, and future of The ToonSeum, art processes, and then we do RAPID FIRE TOPICS! Dan and Jared talk about checking out estate sales, appreciating collections, Joss Whedon exiting the Batgirl movie, and Chris Samnee leaving Marvel with Captain America #700. Michael Bay to direct a Lobo movie? Joaquin Phoenix to play The Joker? Dan, Jared, Scott, and Shawn engage in a casual conversation about comics, TV, and movies. Everything old is new again! In this episode, we discuss the revivals of Strangers in Paradise XXV, Marvel Two-In-One, and Youngblood, along with Mister Miracle (both the new and old series).